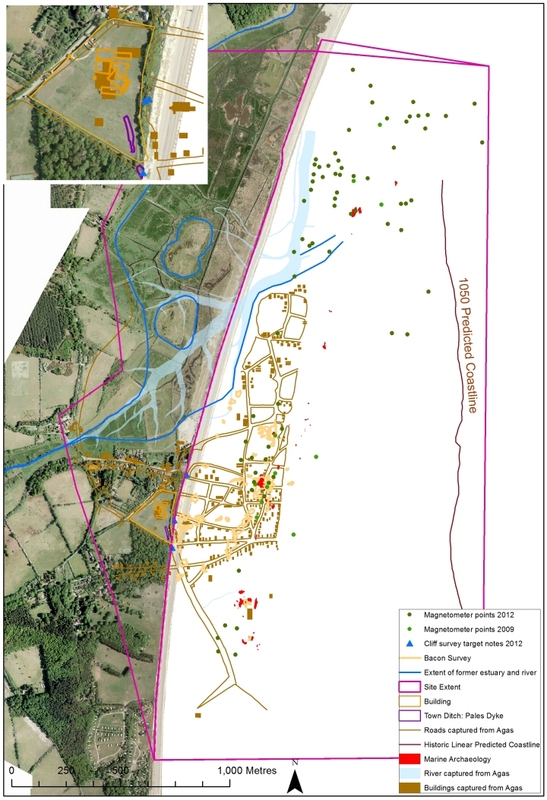 The figure on this page maps all the known archaeology for the site including recent data provided by the Time Team excavations in 2011. The result is an archaeological inventory across the land to marine transition. The Purple hatched line represents the current boundary between in-situ archaeological remains (landward) and those disturbed by coastal processes. The majority of marine archaeology is associated with stone buildings located in the main centre of the town. It is assumed that this continues to the east (seaward), but are currently undetectable under the 1-3m of sand covering this area. The existence of considerable stone work located in approximately the same position indicated on the Agas map, suggests that earlier stone buildings lie under the sands, and that were they to be identified, it would be possible to reconstruct the urban geography of the eastern areas of the town.